OUT OF The Wild Sky, the 2018 Macnas Halloween parade, celebrating the act of transformation, creating in its wake, a hypnotic, intoxicating, glittering, mysterious world, filled with shadow and nobility, takes place next week. The parade takes place on Sunday October 28, beginning at the NUI Galway Aula Maxima at 5.30pm before proceeding along University Road, Salmon Weir Bridge, St Vincent's Avenue, St Francis Street, Eglinton Street, William Street, Shop Street, Church Yard Street, Mainguard Street, Bridge Street, O'Brien's Bridge, Dominick Street Lower, Dominick Street Upper, Raven's Terrace, and the Claddagh Quay [see map below]. This year’s parade will feature the signature Macnas giant creations and sculptural images, pyrotechnics, bespoke costumes, and live and original music, via hundreds of performers from the Macnas Young Ensemble (led by Miquel Barcelo ), Youth Ballet West, the Macnas Youth Drummers (led by Eimhin Craddock ), the public participation programme, The Hit Machine, and others. The parade includes the work of the Macnas creative ensemble, comprising of 45 professional artists and 300 volunteers directed by Macnas CEO/artistic director Noeline Kavanagh. The team behind this years inventions include Orla Clogher and Dave Young (design ), Saileog O’Halloran (costume ), Alma Kelleher (sound design ), The Face (hair ), and Michelle Ruane (makeup designer ). “We are very grateful to be supported by the Arts Council of Ireland and Galway City Council for our year long programme of creative work," said Noeline Kavanagh. "We are delighted to have the support of our partners, Latin Quarter, who will co-present this iconic event for the sixth year in a row with Macnas. For the Halloween parade we are thrilled to have the additional support from local Galway business patrons: O’Connells Bar Eyre Square, Acorn Life, and Galway Clinic. 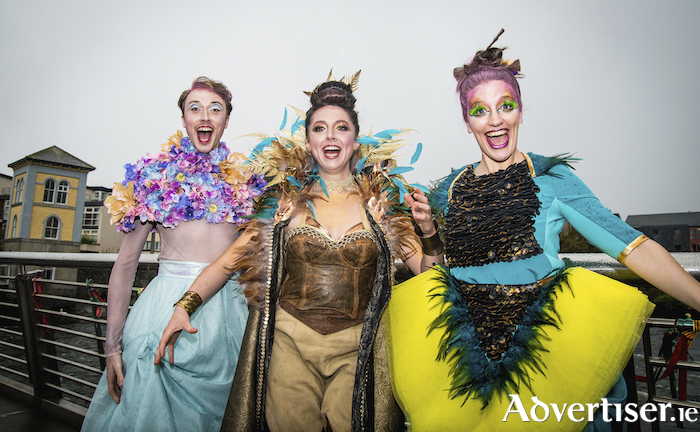 This year and up to 2021 the Connacht Hospitality Group have jumped on board the Macnas train to support the Macnas Young Ensemble which is terrific."